If it is not permitted to you, governors of the Roman empire, sitting in an open and exalted place almost at the very summit of the city, to judge openly and to publicly examine what is clearly going on in the case of the Christians; if in this instance alone your authority is either afraid or ashamed to make enquiry in public, concerning the diligent use of justice; if finally, as has just now happened, the enmity against this sect, having too much exercised itself in private condemnations, forms an obstacle to their defense, let the truth be permitted to reach your ears even by the secret way of silent writings. The contrast is between open inquiry (what the Roman governors ought to engage in) and the secrecy of written communication (what Tertullian offers). A remarkable vocabulary about openness dominates the first half of the sentence: open and exalted, summit of the city, judge openly, publicly examine, what is clearly going on, enquiry in public, diligent use of justice, etc. Rather than this, Tertullian says he’ll settle for slipping them a booklet to read in private: secret, silent, written. The root of the sentence, the simple subject and simple predicate, is “let truth.” And when that “let truth be permitted” finally shows up near the sentence’s end, it echoes the first few words: “If it is not permitted to you…” But Tertullian left those first words (si non licet) passive, never clarifying just who it is who is not permitting the Roman officials to seek the truth. High and exalted as they are, there are nevertheless, apparently, certain things that “it is not permitted” for them to do. Tertullian never says who’s holding the other end of the leash. But he does offer these poor, pet governors a chance at freedom: Let truth be permitted. Let it sneak in, in the form of written communication, silently into the ears of your mind. If truth is too unpopular to hear about in public, sneak a peek at a forbidden book. She enters no plea for her cause, because she feels no wonder at her condition. She knows that she lives as a stranger upon earth, that among aliens she easily finds foes; but that she has her birth, her home, her hope, her honor, and her dignity in the heavens. Let her sneak in through this little book, pleads Tertullian. If you’re not allowed to give her a fair trial, let her sneak in. Well, Tertullian’s opening gambit has all that and more in it. As he constructs the rhetorical situation, he sets up a tension between this present age when injustice is open, and the coming vindication, when truth will make earth her turf, her property, her domain. That dynamic holds the entire Apology together, as it moves through an exposition of the content of the Christian faith to the reality of martyrdom. 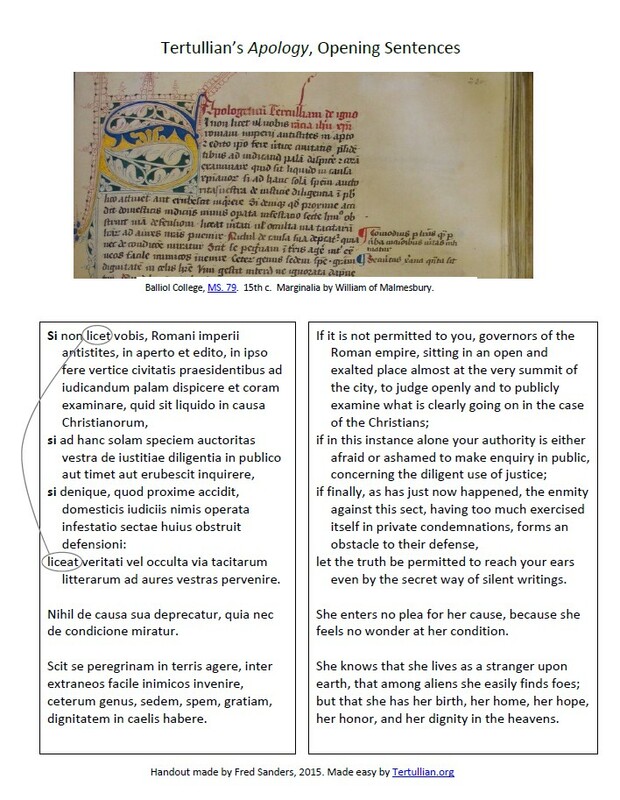 I made a handout to assist in the close reading of this sentence, with English and Latin in parallel columns and a pretty picture of a manuscript of the Apoogeticum for eye candy. For a .pdf of the handout, click on the picture of it above, or here: Tertullian Apology First Sentence Handout. Fred is a systematic theologian with an emphasis on the doctrine of the Trinity. He and his wife Susan have two children, Freddy and Phoebe. They are members of Grace Evangelical Free Church. Read more about Fred here. Sign up for The Scriptorium Daily newsletter, a monthly digest delivered right to your inbox!